Heuer Regatta reference 134.601 in black PVD coating with a bracelet. 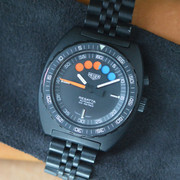 Black dial with white luminous hour and minutes hands and contrasting orange hand, applied index markers and luminous dotted markers at three, six and nine. Bracelet extension. Sapphire crystal. Screw down case back still has sticker.